An apology, promise, celebration and thank you. In that order. A while back I announced I would be self-publishing a novella. I worked hard and started writing posts about the self-publishing process. And then I stopped. Please let me explain. Basically, stuff happened. Lots of stuff. My last self-publishing post was in May, just under a month after my career took a change of direction. That was probably the time when my mind suddenly realised that things had changed. I was trying to force myself into a new way of life too quickly and it snapped and stopped. Cue a month or so off, which I very much needed. This happened to coincide with getting my editor’s notes back and they…well, they weren’t great. (My editor was good, my novella wasn’t.) I knew the book had major problems but for some reason I ploughed ahead anyway. Lesson learned. I discussed it with my main and key advisor (my mum) and decided to rewrite, but getting the motivation while everything else was going on was tricky. I continued to take time off, went on holiday and came back ready to face the world. But still didn’t write much of this particular novella. The self-publishing posts will be returning. As I don’t have a manuscript ready yet, I will look at the all-important marketing of your beloved book, because that’s what my background is in. And when I get there, I’ll share my experiences of book covers, editing, proofing and publishing. The week before last was awful. 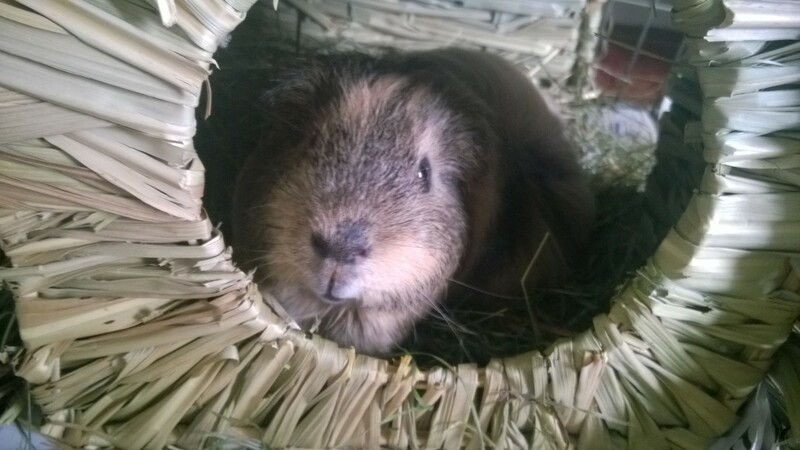 We spent a lot of it down the vets trying to figure out why my gorgeous, fat guinea pig had stopped eating. I thought the end was nigh and shed many tears. Thankfully, unnecessary tears. Turns out his teeth were a little overgrown. He’s now fully recovered and back to eating everything at top speed. His double chin is even growing back. My gorgeous little Diddles, all better now! In December 2013 I received an email to tell me that my science fiction short story had been placed 2nd in a writing competition. I was over the moon! After many months I received my prize money, got the magazine where my name wasn’t printed (usually all winners and short listed writers are named) due to the length of the winning entry, and spent weeks checking the website where my story was supposed to be published. Nothing. I began to wonder if I could resell it after the magazine lost their rights towards the end of this year. Then, for no reason whatsoever, I happened to check the website last week. Lo and behold, there it was! You can now read my (short – it’ll take 10 mins tops) winning entry, Us and Them, here. I was overwhelmed by the response of my last post about author’s names and writing as a woman. The poll results are very interesting. That being said, I’m not going to make any decisions until the end of July, so there’s still time to vote! Righto, back to that novella. Rewriting is not that bad, just consider it as the chance to optimise. Secondly, loved your story! What great feedback, too. Aww thanks 😀 Diddles would say thank you (from a deep dark hiding place because he’s a mahoosive coward! ), but he’s lying flat out at the moment. Hot pig! And thank you! I’m glad you liked it. I was very happily surprised by the judges comments, might print and frame them!! This blog tells the tales of becoming a published writer, whether it's fiction or freelancing. As the months go on, you'll find hints, tips and updates about writing and getting published. Warning: I'm a SFF writer, so expect dragons, ghosts, monsters and all things geek.